SAE Institute, a premier provider of creative media education, will partner with the International Music Software Trade Association (IMSTA) to host IMSTA FESTA, a celebration of music technology, at its New York campus on Saturday, September 24 from 11am to 6pm. IMSTA FESTA NYC is an annual celebration of music technology open to all to attend at no charge. It is such a great opportunity for current and former students as well as the public to meet professionals in the audio field. 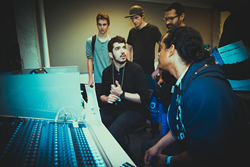 Free to attend and open to the public, IMSTA FESTA is a one-day networking and learning event that brings together a group of top audio technology companies in an exciting environment that provides face-to-face interaction with music makers. Attendees are set to include music entrepreneurs, professional and semi-professional musicians, DJs, songwriters, music producers, audio engineers, music students, and music educators. Anyone who makes music or is interested in the art of music making is sure to benefit from this event in numerous ways. You’ll find new opportunities to make connections, gain knowledge and ideas, and accelerate careers, as well as learn about new techniques in music production, legal software use, and using music software to enhance their skills. IMSTA FESTA is known for bringing together the best minds, innovators, heavyweight music industry professionals, and music and audio companies to share fresh perspectives, keen insights and first-hand knowledge on the state of the music business, music production, technology, and more. Scott Jacoby, acclaimed composer, GRAMMY® award-winning writer, producer, engineer, mixer, musician and recording artist, Founder/President of EUSONIA Records, Owner of EUSONIA Studios, CEO of SCOJAC Music Productions will deliver the keynote address at IMSTA FESTA NYC 2016. With his work spanning all genres of music, and collaborations with notable musicians including John Legend, Vampire Weekend, Sia, Rachel Platten, Laura Izibor, Jose James, Vanessa Hudgens, Fabolous, Naturally 7, Cory Henry, Chimene Badi, Jackie Evancho and Ronnie Spector, his speech is sure to add a great deal of excitement to the lively atmosphere.